Pathologic proliferation of mesangial and parietal epithelial cells (PECs) is a hallmark of various glomerulonephritides. Macrophage migration inhibitory factor (MIF) is a pleiotropic cytokine that mediates inflammation by engagement of a receptor complex involving the components CD74, CD44, CXCR2, and CXCR4. The proliferative effects of MIF may involve CD74 together with the coreceptor and PEC activation marker CD44. Herein, we analyzed the effects of local glomerular MIF/CD74/CD44 signaling in proliferative glomerulonephritides. MIF, CD74, and CD44 were upregulated in the glomeruli of patients and mice with proliferative glomerulonephritides. During disease, CD74 and CD44 were expressed de novo in PECs and colocalized in both PECs and mesangial cells. Stress stimuli induced MIF secretion from glomerular cells in vitro and in vivo, in particular from podocytes, and MIF stimulation induced proliferation of PECs and mesangial cells via CD74. In murine crescentic GN, Mif-deficient mice were almost completely protected from glomerular injury, the development of cellular crescents, and the activation and proliferation of PECs and mesangial cells, whereas wild-type mice were not. Bone marrow reconstitution studies showed that deficiency of both nonmyeloid and bone marrow–derived Mif reduced glomerular cell proliferation and injury. 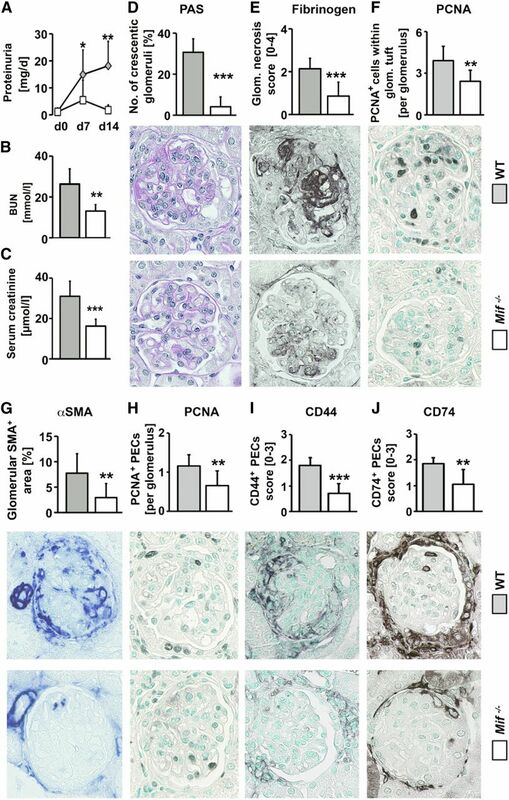 In contrast to wild-type mice, Cd74-deficient mice also were protected from glomerular injury and ensuing activation and proliferation of PECs and mesangial cells. Our data suggest a novel molecular mechanism and glomerular cell crosstalk by which local upregulation of MIF and its receptor complex CD74/CD44 mediate glomerular injury and pathologic proliferation in GN. In the healthy human kidney, MIF is constitutively expressed in tubular epithelial cells, endothelial cells, mesangial cells, and podocytes.8 Upon glomerular injury, increased MIF expression occurs in resident renal and infiltrating inflammatory cells.10 MIF inhibition by neutralizing antibodies led to reduced glomerular injury in experimental murine IgA nephritis and in rats with crescentic GN.11–14 In experimental lupus nephritis, both genetic Mif deficiency and inhibition using a small-molecule inhibitor were renoprotective.12,15 These effects were mainly ascribed to the proinflammatory, recruitment-related activities of MIF. In vitro, MIF also exerted proinflammatory effects in podocytes via the CD74 receptor.16 Apart from this, there are no data on the possible direct effects of MIF on glomerular cells and the potential receptors involved. Here, we analyzed the regulation and the involvement of MIF and its receptor CD74 in glomerular cell proliferation in vitro and in vivo. Previous reports characterized human renal expression of MIF in glomerular diseases.8,10,27,28 Here we extend these findings, showing that compared with controls (time-zero biopsy of living donor kidneys), MIF mRNA expression was increased up to fivefold in microdissected human glomeruli of patients with mesangioproliferative IgA nephropathy (IgAN) and even significantly higher (up to 12-fold) in rapidly progressive GN (RPGN) (Figure 1A). Using immunofluorescence in healthy human kidneys, MIF was detected at a low intensity in some glomerular cells, in particular podocytes and PECs, but also in mesangial cells (Figure 1, B–B′′). In RPGN, MIF was detected in resident glomerular cells and its expression was increased in podocytes and PECs, in particular those forming crescents (Figure 1, C–C′′). In IgAN, MIF expression was increased in particular in podocytes, PECs, and also in other resident glomerular cells (Figure 1, D–D′′). The patients with IgAN are significantly different from those with RPGN in terms of renal excretory function and proteinuria, both of which may have had an impact on the staining pattern and thereby the differences compared with healthy kidneys. The upregulation of CD44 in resident glomerular cells and the de novo expression in PECs during glomerular diseases was previously documented by us and others.19,29,30 We extend these data herein by quantitative analyses of CD44 mRNA expression in microdissected glomeruli showing a significant, up to eightfold, upregulation of CD44 in RPGN and IgAN (Supplemental Figure 1B). MIF and its receptor CD74 are upregulated in human glomerulonephritides. Reat-time qRT-PCR results obtained from microdissected glomeruli of patients with RPGN (n=9), IgAN (n=10), and controls (pretransplant allograft biopsies [LD], n=7) showed a significant upregulation of (A) MIF and (F) CD74 in glomerulonephritides compared with controls. mRNA expression levels for each gene are shown as ratios calculated against GAPDH. (B–B′′) In healthy controls, only minimal expression of MIF (pink/Alexa-647, nuclei counterstained with blue/DAPI) in podocytes (arrows), PECs (arrowheads), and mesangial cells (asterisks) was observed. (C–C′′) In RPGN, overexpression of MIF in cells forming the crescent was found. (D–D′′) Interestingly, in IgAN MIF was not only upregulated in mesangial cells (asterisks), but also in PECs (arrowheads) and podocytes (arrows). (G, G′) CD74 was only minimally expressed in healthy human kidneys by some podocytes (arrows) and mesangial cells (asterisks). (H, H′) In RPGN and (I, I′) IgAN, CD74 expression increases in podocytes and was de novo expressed by PECs (arrowheads). (E–E′′, J/J′) Negative controls demonstrated specificity of the staining. The second row in panels B–E shows overlay of immunofluorescence and light microscopy. The second row of panels G–J and third row in panels B–E shows digital enlargement of the lower area. Original magnifications 200×, scale bars represent 50 μm. Each dot represents one patient and red bars represent means. *P<0.05 versus LD; **P<0.01 versus LD; ##RPGN versus IgA, P<0.01. CD74 mRNA was significantly elevated in RPGN, whereas in IgAN CD74 was only slightly increased (Figure 1F). Immunohistochemical and fluorescence analyses of CD74 showed low expression in healthy human glomeruli, mostly localized to podocytes and endothelial cells (Figure 1, G and G′, Supplemental Figure 1, A–A′′′′), in line with a single previous report.16 In crescentic GN, de novo expression of CD74 was found on PECs, and, similarly to MIF, particularly on cells forming the crescents (Figure 1, H and H′). In IgAN, increased expression of CD74 was observed in both PECs and podocytes. Taken together, both MIF and its receptor CD74 are highly upregulated in human proliferative glomerular diseases and in part expressed de novo by intrinsic glomerular cells. In healthy mice, we found no detectable glomerular expression of CD74 by immunohistochemistry (Figure 2B), with only some positive interstitial cells, presumably dendritic cells. In a murine model of crescentic GN, the nephrotoxic-serum nephritis (NTN) model, CD74, was expressed de novo in mesangial cells and PECs, particularly in those forming the crescents (Figure 2C). MIF and CD74 are upregulated in murine kidneys after glomerular injury. In healthy murine kidneys, CD74 was only expressed by some interstitial, presumably dendritic cells (arrows) (B). Upon induction of NTN, CD74 was massively upregulated and de novo expressed by mesangial cells (asterisk) and PECs (arrowheads) (C). Immunohistochemistry staining for CD44 revealed a similar expression pattern. In healthy glomeruli, CD44 was completely absent (E), but like CD74, de novo expressed by PECs (arrowheads) and mesangial cells (asterisk) in NTN. Negative controls were completely negative for both antibodies (A, D). CD44 and CD74 (C, F) were performed on consecutive slides demonstrating coexpression on PECs and mesangial cells. Double immunofluorescence staining for CD44 (green/Alexa-488; G, G′) and CD74 (red/Alexa-555; H, H′) in NTN revealed a coexpression (yellow/merged) of both receptors on cells inside the glomerulus (dashed circle), mostly on cells of the crescent (arrowheads; I, I′). CD74 (green/Alexa-488; J, J′) was additionally expressed by F4/80+ (red/Alexa-555; K, K′) immune cells surrounding the glomerulus (arrow). PECs were only CD74-positive, as expected (arrowheads; L, L′). The second row in panels G–L shows digital enlargement of the lower area. Original magnifications 400×, scale bars represent 25 μm. Real-time qRT-PCR analyses of Mif (M), Cd74 (N), and Cd44 (O) during the NTN time course (days 3, 7, 14, and 21) showed a significant increase of all three genes corresponding to immunohistochemistry (healthy kidneys set as one dashed orange line, n=5 for each group). Data are means±SD *P<0.05 versus healthy. Using immunohistochemistry, the CD74 coreceptor CD44 was virtually absent in healthy murine glomeruli (Figure 2E). During NTN, an increase in CD44 expression occurred on activated PECs and mesangial cells (Figure 2F). Staining of consecutive slides supported the coexpression of CD74 and CD44 in both PECs and mesangial cells during disease (Figure 2, C and F). Immunofluorescence staining for CD44 and CD74 confirmed these results (Figure 2, G–I, Supplemental Figure 2, A–A′′′) and showed their colocalization, with CD44 being expressed on cell membranes only, whereas CD74 was localized both to cell membranes and intracellular compartments (Figure 2I). Costaining with proliferation marker Ki67 or proliferating cell nuclear antigen (PCNA) confirmed the expression of CD74 in proliferating PECs in injured murine (Supplemental Figure 2, B–B′′′) and human glomeruli (Supplemental Figure 2, C–C′′′), respectively. We next analyzed the mRNA expression of Mif, Cd74, and Cd44 over the time course of NTN. Mif was upregulated already on day 3 after disease induction by approximately 80% and remained increased thereafter (Figure 2M). Cd74 expression increased even more dramatically, with a peak at day 7 (30-fold increase) and a sustained upregulation during the later course (15-fold increase; Figure 2N). The expression of Cd44 showed a similar pattern as Cd74 with a peak at day 7 (110-fold increase; Figure 2O). Taken together, in a murine NTN model of crescentic GN, MIF, CD74, and CD44 were greatly upregulated and in part expressed de novo, in particular in PECs. The expression pattern largely mirrored that of patients with glomerular diseases and crescentic GN. To analyze the regulation and cellular effects of CD74 and MIF, we used our recently developed primary cultures of murine podocytes and PECs with proven origin31 and the well established cultures of primary mesangial cells.32,33 Flow-cytometric analyses of the primary cultures showed that PECs, podocytes, and mesangial cells expressed CD74, whereas only PECs and mesangial cells coexpressed CD44 (Figure 3A), confirming our in vivo immunohistochemic data. None of the cell types showed detectable CXCR2 expression and only faint CXCR4 levels. MIF receptors are expressed on primary isolated glomerular cells and MIF is upregulated and secreted following glomerular stress. (A) Mesangial cells (upper row), podocytes (middle row), and PECs (lower row) were isolated and analyzed for MIF receptors by FACS in passage five. CD74 (first panel) was expressed by all glomerular cells, whereas CXCR2 (third panel) was not and CXCR4 (fourth panel) was only minimally expressed. CD44 was expressed on mesangial cells and PECs, but not on podocytes (second panel). Stimulation of primary murine podocytes with ADR (25 μg/ml) and NTS (0.1%) for 24 and 48 hours (B) induced MIF secretion and increased (C) MIF mRNA and (D) MIF protein, whereas TGFβ1 (5 ng/ml) had only minimal effect. Intravenous injection of ADR (25 mg/kg body wt) into the tail vein of WT mice (n=3) followed by isolation of glomeruli by ferric oxide 24 hours later (Scheme) led to a clear upregulation of MIF protein in glomeruli compared with untreated WT mice (n=3). (E) Western blot was analyzed by measurement of band densitometry normalized to GAPDH. Values of unstimulated (unstim.) cells were set as 1. Data are means±SD *P<0.05 versus unstim. Original magnifications, ×200. Scale bars represent 50 μm. To analyze the regulation and secretion of MIF in injured glomerular epithelial cells, we induced podocyte stress by stimulation with 0.1% nephrotoxic sheep serum (NTS, used for the induction of NTN), 5 ng/ml TGFβ1 or 25 μg/ml adriamycin (ADR). Both NTS and ADR led to substantial MIF protein secretion after 24 hours of stimulation (Figure 3B), which further increased over time. A less pronounced secretion of MIF was observed following TGFβ1 only detectable at 48 hours. Incubation with NTS induced increased MIF secretion also in mesangial cells and PECs. Both cell types secreted MIF also in the steady state without stimulation (Supplemental Figure 3). At the mRNA level, stimulation of podocytes with ADR and NTS led to a significant increase in Mif after 24 hours (Figure 3C). In accordance with the Western blotting data, TGFβ1 stimulation induced only a slight increase in Mif transcript number. The increased MIF expression was confirmed using immunofluorescence staining of podocytes (Figure 3D). To address the in vivo relevance of MIF upregulation in glomerular cells, we next tested the effects of a single intravenous injection of ADR in healthy mice on the expression of MIF in isolated glomeruli. One day after ADR injection, we found a significant upregulation of MIF expression in the glomeruli when compared with vehicle-injected mice (Figure 3E). Taken together, glomerular cells, in particular podocytes, upregulated their MIF expression and secretion upon stress both in vitro and in vivo. Compared with vehicle-exposed cells, mesangial cells stimulated with recombinant murine MIF (rmMIF) demonstrated a significantly higher mitogenic response (Figure 4A). Similarly, PECs treated with rmMIF exhibited a significantly increased cell proliferation rate (Figure 4C). This effect was additive to that of the well described mitogenic PDGF-BB in both PECs and mesangial cells (Figure 4, B and D). On the other hand, podocytes were not responsive to rmMIF (Supplemental Figure 4A). 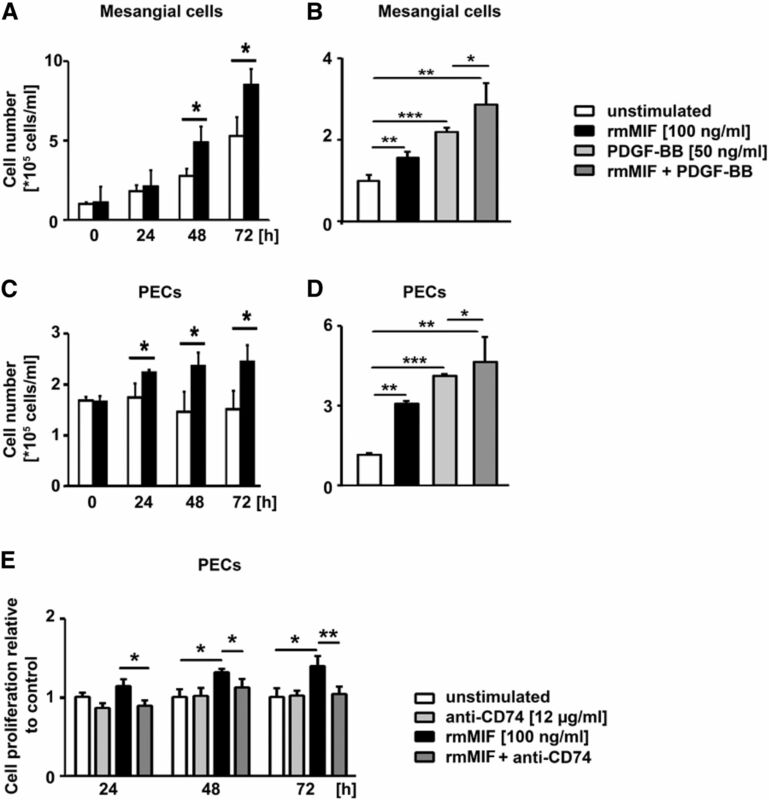 MIF induces cell proliferation of PECs and mesangial cells via CD74. Stimulation with 100 ng/ml rmMIF (black bars) increased cell doubling of (A) mesangial cells and (C) PECs compared with unstimulated controls (white bars). PDGF-BB (light gray bars), as a potent growth factor, induced cell doubling of (B) mesangial cells and (D) PECs to a higher extent than MIF (black bars), but the proliferative effects of MIF were additive to the PDGF-BB effects (dark gray bars). (E) 5-Bromo-2-deoxyuridine assay confirmed the proliferative effect of rmMIF (black bars) on PECs compared with unstimulated controls (white bars) or cells incubated with inhibitory anti-CD74 antibody (12 μg/ml) alone (light gray bars) and demonstrated a CD74-dependent MIF effect (dark gray bars). All experiments were performed three times as triplicates. Data are means±SD. *P<0.05 versus unstim. ; **P<0.01 versus unstim. ; ***P<0.001 versus unstim. Based on the expression data shown above and previous reports suggesting that CD74 prominently mediates proliferative effects of MIF in nonrenal cells,5,8,9,34,35 we hypothesized that CD74 is responsible for the proliferative effects of MIF. Preincubation of PECs with a neutralizing anti-CD74 inhibitory antibody 1 hour prior to stimulation of the cells with rmMIF abolished the MIF-induced proliferative response of PECs, whereas anti-CD74 alone had no effect (Figure 4E). MIF stimulation of PECs induced the expression of CD44, suggesting that MIF might directly lead to PEC activation and contributes to upregulation of its own coreceptor in a self-amplifying loop (Supplemental Figure 4C). With regard to proinflammatory phenotypic changes of PECs, stimulation with rmMIF led to a significant, however only slight, increase in Ccl2 chemokine expression 24 hours after stimulation, while this effect was lost 48 hours after stimulation. Ccl5 expression in PECs was not changed 24 and 48 hours after stimulation with MIF (Supplemental Figure 4B). MIF stimulation had no effect on the expression of Pdgfb and its receptor Pdgfrb in PECs (Supplemental Figure 4, D and E). To address the in vivo relevance of the above findings, we compared Mif−/− and wild-type (WT) littermates with NTN. Proteinuria was significantly reduced in Mif−/− compared with WT mice. On day 14, the values observed in Mif−/− mice were nearly identical to values prior to disease induction (Figure 5A). Compared with WT mice, Mif−/− mice also had significantly lower BUN and serum creatinine levels (Figure 5, B and C). MIF deficiency attenuates glomerular injury in vivo. Mif−/− mice (white bars, n=13) exhibited preserved renal function compared with WT mice (gray bars, n=6) with less (A) proteinuria, (B) BUN level, and (C) serum creatinine. Also, glomerular injury was decreased at day 14 after NTN induction in Mif−/− versus WT animals analyzed by scoring of (D) PAS and (E) fibrinogen. (F) Evaluation of PCNA-positive cells within the glomerular tuft revealed a decreased proliferation in Mif−/− mice compared with WT. (G) Morphometric evaluation of glomerular α-SMA showed significantly reduced activation and expansion of mesangial cells. In addition, PECs proliferated less in (H) Mif−/− and showed reduced activation as assessed by expression of (I) CD44- and (J) CD74-positive PECs compared with WTs. Diagrams on the right show data obtained by scoring or computer-based morphometric analyses on day 14 after induction of NTN. Values indicate the mean of scoring or the relative area (in %) of tissue that immunostained positively. Data represent means±SD. *P<0.05 versus WT; **P<0.01 versus WT; ***P<0.001 versus WT. Mif−/− mice exhibited a significant reduction in the number of extracapillary proliferates (crescents) by 87% compared with WT littermates (Figure 5D). Compared with WTs, Mif−/− mice had a less dramatic but highly significant reduction of glomerular necrosis by 50% (Figure 5E). Compared with WTs, a significantly reduced proliferation of cells within the glomerulus was found in Mif−/− mice (Figure 5F). 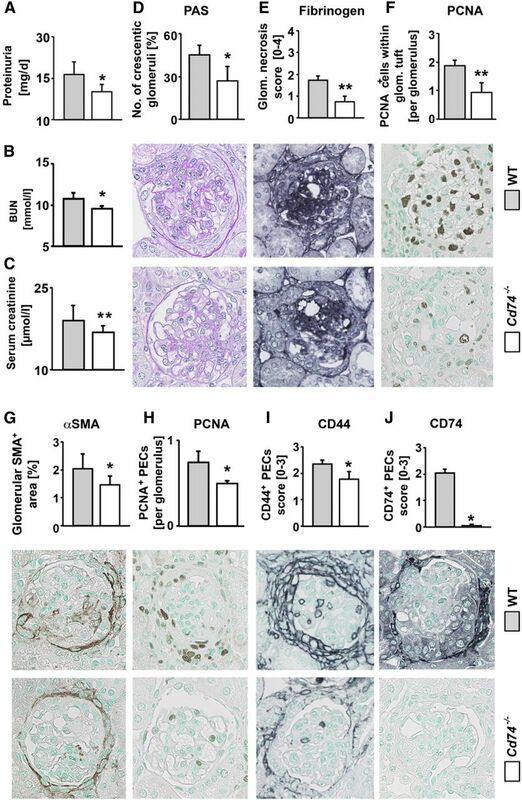 Furthermore, Mif−/− mice showed prominent reduction in the expression of glomerular α-smooth muscle actin (α-SMA), a marker of activated and expanded mesangial cells (Figure 5G). The proliferation of PECs, analyzed outside of cellular crescents, was strongly and significantly reduced (Figure 5H). Quantification of activated, i.e., CD44-positive PECs, demonstrated their intense activation in WT mice with NTN, whereas CD44 was virtually absent in the PECs of Mif−/− mice (Figure 5I). In line with the latter finding, CD74 expression in PECs was also significantly lower in the Mif−/− animals (Figure 5J). Interstitial immune cell infiltration, including periglomerular infiltrates staining positively for F4/80, ErHr3, and CD3 (Supplemental Figure 5, C–E), were significantly reduced in Mif−/− compared with WT mice. Glomerular immune cell infiltrates were rather rare and similar in both groups (data not shown). The decrease in body weight during NTN was similar in both groups, as was the binding of sheep IgG to the glomerular basement membrane (Supplemental Figure 5, A and B), suggesting that Mif deficiency had no effect on disease induction. We next analyzed the expression of the three MIF receptors using quantitative real-time RT-PCR (qRT-PCR). Cd74 and Cxcr4 were significantly downregulated in Mif−/− compared with WT mice (–54% and –60%, respectively), while Cxcr2 expression showed no difference between both groups, corroborating our in vitro data (Supplemental Figure 5F). To address the role of infiltrating inflammatory cell–derived versus nonmyeloid MIF, we performed bone marrow reconstitution experiments in WT and Mif−/− mice with NTN. We compared WT recipients with bone marrow from WT donors (WTBM/WT), WT recipients with bone marrow from Mif−/− donors (Mif−/−BM/WT), and Mif−/− recipients with bone marrow from WT donors (WTBM/Mif−/−). Prior to NTN induction, all mice had similar proteinuria (data not shown). Compared with WTBM/WT mice, mice lacking bone marrow (Mif−/−BM/WT) or nonmyeloid MIF (WTBM/Mif−/−) had significantly and similarly reduced indices of renal injury as shown for renal function parameters proteinuria (–83% and –84%, respectively), BUN (–13% and –19%, respectively), and serum creatinine (–23% and –17%, respectively; Figure 6, A–C). This was mirrored by a significant reduction in the extent of glomerular necrosis (–60% and –59%, respectively), the number of glomerular crescents (–54% and –61%, respectively), the extent of pathologic glomerular cell proliferation using PCNA staining and pathologic cell activation shown by CD44 and CD74 staining (Figure 6, D–J). Interestingly, compared with the Mif−/−BM/WT group, WTBM/Mif−/− mice had significantly more reduced indices of pathologic cell proliferation and activation. Compared with WTBM/WT mice, both Mif−/−BM/WT and WTBM/Mif−/− mice also had significantly reduced interstitial and periglomerular immune cell infiltrates analyzed by staining for F4/80, ErHr3, and CD3 (Supplemental Figure 6, A–C). The decrease in body weight during NTN was similar in all groups (data now shown). Deficiency of nonmyeloid and bone marrow–derived MIF similarly reduced glomerular injury in NTN. Compared with WT recipients with bone marrow from WT donors (WTBM/WT; gray bars, n=5), WT recipients with bone marrow from Mif−/− donors (Mif−/−BM/WT; gray bars with white dots, n=5) and Mif−/− recipients with bone marrow from WT donors (WTBM/Mif−/−; white-gray striped) had reduced (A) proteinuria, (B) BUN, and (C) serum creatinine. Accordingly, less glomerular injury was found in mice deficient for nonmyeloid or bone marrow Mif analyzed by (D) number of crescents and (E) scoring of fibrinogen-positive glomerular necrosis. (F) Evaluation of PCNA-positive cells within the glomerular tuft revealed a decreased proliferation in Mif−/−BM/WT and WTBM/Mif−/− mice compared with WTBM/WT. (G) Morphometric evaluation of glomerular α-SMA showed only very slight increase in mesangial cell activation in all groups. (H) In addition, PECs proliferated less in Mif−/−BM/WT and WTBM/Mif−/− mice, and showed reduced activation as assessed by expression of (I) CD44- and (J) CD74-positive PECs compared with WTBM/WT. Diagrams on the right show data obtained by scoring or computer-based morphometric analyses. Values indicate the mean of scoring or of the positively stained area (in %). Data represent means±SD *P<0.05; **P<0.01; ***P<0.001. To address the functional role of the CD74 receptor in proliferative GN, we compared Cd74−/− mice with WT littermates. We first assessed whether Cd74−/− mice develop a spontaneous renal phenotype. In healthy mice, we found no pathologic changes in the kidneys and found no difference in functional or histologic parameters between Cd74−/− and WT mice (Supplemental Figure 7, A–H). Next, we induced NTN in Cd74−/− and WT mice. 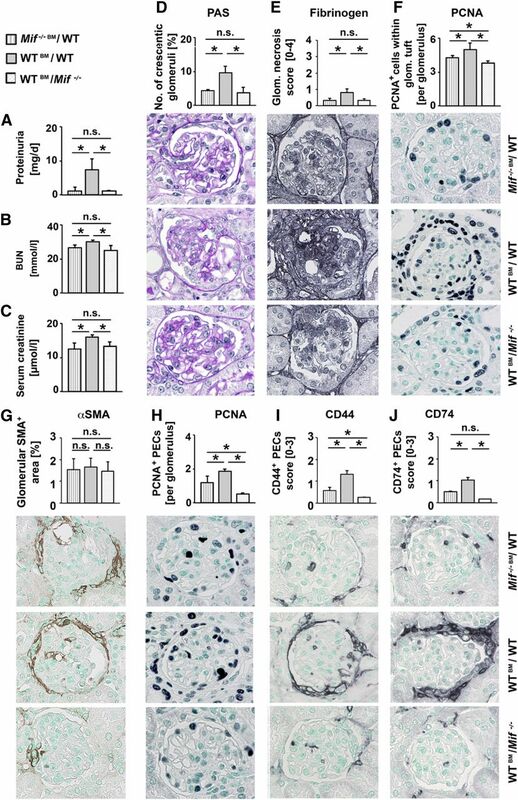 Compared with WT mice, Cd74−/− mice were significantly protected from glomerular injury shown by reduced proteinuria (–38%), BUN (–27%) and serum creatinine (–8%; Figure 7, A–C). Histologic assessment of renal injury showed a significant reduction of glomerular necrosis (–57%), the number of crescents (–40%), and the extent of glomerular cell proliferation and activation (Figure 7, D–H). Staining with CD74-specific antibody showed no signal in Cd74−/− mice, supporting the specificity of our staining and the genetic knockout (Figure 7J). Cd74−/− mice had also fewer interstitial and periglomerular immune cell infiltrates (Supplemental Figure 8, A–C). The protective effect observed in Cd74−/− mice was very similar to that found in Mif−/− mice, albeit numerically lower. Cd74 deficiency attenuates glomerular injury in NTN. Compared with WT (gray bars, n=5), Cd74−/− mice (white bars, n=4) had significantly less (A) proteinuria, (B) BUN, and (C) serum creatinine. Glomerular injury was also reduced in Cd74−/− versus WT animals as shown for the extent of (D) glomerular crescents and (E) necrosis. Compared with WT, Cd74−/− mice had (F) decreased proliferation analyzed by the number of PCNA-positive cells within the glomerular tuft, (G) reduced activation and expansion of mesangial cells analyzed by morphometric evaluation of glomerular α-SMA, (H) reduced proliferation of PECs analyzed by counting of PCNA-positive PECs, and (I) reduced activation of PECs assessed by number of CD44-positive PECs. (J) Cd74−/− had no signal in immunohistochemistry for CD74, confirming the CD74 deficiency of these mice and CD74 antibody specificity. Diagrams on the right show data obtained by scoring or computer-based morphometric analyses. Values indicate the mean of scoring of the positively stained area (in %). Data represent means±SD. *P<0.05 versus WT; **P<0.01 versus WT; ***P<0.001 versus WT. A number of glomerular diseases are characterized by pathologic cell proliferation. We have shown previously that PEC activation and proliferation is crucial in the formation of cellular crescents and thereby for the development and progression of crescentic glomerulonephritides.17,36,37 Mesangial cell proliferation is a relatively common pathologic finding in various glomerular diseases including lupus nephritis, IgAN, and to some degree in diabetic nephropathy. In particular, in IgAN, the extent of mesangial proliferation is an important indicator of disease progression.20 Here, we identified MIF and its receptor complex CD74/CD44 as a novel molecular pathway mediating intrinsic glomerular cell crosstalk leading to pathologic proliferation of cells involved in mesangioproliferative and crescentic lesions, and thereby leading to an aggressive and progressive course of glomerulonephritides. The second major and novel finding was that the MIF receptor CD74 was highly upregulated and expressed de novo in injured glomerular cells, in particular PECs. Similar to MIF, CD74 showed a comparable regulation in mice and humans. The only study that has analyzed CD74 in kidneys so far reported an intracellular and cell membrane localization of CD74 in cultured podocytes in vitro and in diabetic nephropathy in vivo.16 We also found CD74 to be expressed on podocytes and noted an upregulation upon podocyte injury in our models. Furthermore, our immunofluorescence staining for CD74 also showed both membranous and intracellular staining, whereas its coreceptor CD44 was expressed exclusively on the cell surface. CD74 that is localized on the cell membrane can undergo proteolytic cleavage and the intracellular cytoplasmatic domain shuttles into the nucleus to activate gene transcription, e.g., of MCP-1.45 In line with this, stimulation of PECs with MIF induced MCP-1 expression in vitro. The third novel finding of our study was that Cd74−/− mice,46 similarly to Mif−/− mice, were significantly protected from glomerular injury and pathologic glomerular cell proliferation and activation during crescentic GN. These data further support the relevance of the MIF–CD74/CD44 pathway in proliferative glomerular diseases. Similar to healthy Mif−/− mice, healthy Cd74−/− mice showed no pathologic renal phenotype. This suggested that both MIF and CD74 are dispensable for normal kidney development and physiologic functions, but become relevant during glomerular disease. The fourth major finding of our study was that MIF was upregulated and secreted from virtually all intrinsic glomerular cells under stress. In particular, MIF was secreted de novo from injured podocytes both in vitro and in vivo. Importantly, our data showed a similar manner of regulation in human disease and in a relevant animal model, supporting the translational relevance of these findings. Our data also point to an intensive crosstalk between podocytes and PECs and mesangial cells during glomerular diseases (Supplemental Figure 9). Although inflammatory cells are considered the most prominent source of circulating MIF upon inflammation, MIF is also secreted in response to various stress stimuli by different cells in the body, including endothelial cells, platelets, and certain organ-resident parenchymal cells.47–51 In renal cells, no data on MIF secretion existed, albeit increased MIF expression was found in tubular cells after stimulation with angiotensin II and in mesangial cells after stimulation with IgA from patients with IgAN or with various inflammatory cytokines.28,50,52–54 Our bone marrow reconstitution experiments support the idea that both bone marrow, i.e., inflammatory cell-derived, MIF as well as local MIF are involved in the pathogenesis of proliferative GN. Studies of markers for PEC activation helped us to understand their biology and their involvement in disease conditions such as crescentic GN or FSGS.19,23,55 The fifth major and novel finding of our study was that the de novo expression of CD74 in PECs during glomerulonephritides might serve as a novel sensitive marker of PEC injury and activation. It was previously shown that CD44 is a necessary coreceptor for MIF signaling via CD74.56 Our data support these findings because only cells that expressed both receptors proliferated upon MIF stimulation, whereas podocytes, which only expressed CD74, did not. It should be mentioned that previous studies found no evidence for MIF binding to CD44,8 suggesting that both receptors are required for MIF-induced cell proliferation, but that only CD74 binds MIF. Accordingly, the addition of CD74-neutralizing antibody was sufficient to completely abolish the proliferative effects of MIF in renal cells. We previously showed that CD44 is a specific and early marker of activated PECs.17,18 Our present data extend these findings and suggest a functional involvement of CD44 in glomerular lesions characterized by PEC and mesangial cell proliferation, acting as a crucial coreceptor of CD74. In conclusion, we found that the MIF–CD74/CD44 axis is upregulated and in part de novo expressed in resident glomerular cells in humans and animals, and crucially involved in the pathologic proliferation of glomerular cells. Our data suggest a novel mechanism of injury in proliferative glomerular diseases. Human kidney biopsies were collected in a multicenter study (European Renal cDNA Bank-Kroener-Fresenius Biopsy Bank; see Cohen et al.58 for participating centers) and were obtained from patients after informed consent and with approval of the local ethics committees. Following renal biopsy, the tissue was transferred to RNase inhibitor and microdissected into glomerular and tubular fragments. Total RNA isolation from microdissected glomeruli and real-time qRT-PCR were performed as reported earlier.59 Predeveloped TaqMan reagents were used for human MIF (NM_002415.1), CD74 (NM_001025158.2), and CD44 (NM_000610.3), as well as the reference genes 18S rRNA and glyceraldehyde 3-phosphate dehydrogenase (GAPDH) (Applied Biosystems). The expression of the candidate gene was normalized to the reference genes. The mRNA expression was analyzed by standard curve quantification. Demographic data are given in Table 1. All animal experiments were approved by the local and government review boards. The animals were held in cages with constant temperature and humidity with ad libitum access to tap water and standard chow. Mif−/− mice were characterized previously and showed no obvious renal phenotype (see Harper et al.,60 Bozza et al.,61 Satoskar et al. 62, and data not shown). We used Mif−/− mice to focus on local MIF effects in the kidney, whereas previous studies using MIF inhibitory antibodies rather analyzed the effects of systemic and/or circulating MIF. NTN was induced in 13-week-old male Mif−/− (n=13) and C57Bl/6N (n=6) WT littermates by intraperitoneal injection of 750 μl NTS and 40 μg CpG-oligonucleotide. One day prior to NTS injection and one day prior to euthanizing, the mice were placed in metabolic cages for 24-hour, stoolfree urine collection for biochemical analyses. Standard blood and urine parameters were measured. The bone marrow reconstitution experiments in Mif−/− and WT littermates were performed as described previously using a well established protocol and in line with this a reconstitution rate of 96%±2% was reached.3,63–65 For bone marrow transplantation, 10-week-old female Mif−/− (n=5) and C57Bl/6N (n=10) WT littermates were used as recipients and 10-week-old male Mif−/− (n=3) and C57Bl/6N (n=4) WT littermates as donors. Recipients were irradiated with 6.8 Gy for 8 minutes two times with a pause of 4 hours. Bone marrow cells (2×106) obtained from the femur and tibia of donor mice were injected via the tail vein in recipient mice 6 hours after the first irradiation. All mice were treated with sulfadoxinum and trimethoprimum via drinking water for 2 weeks. After an additional 2 weeks, i.e., 4 weeks after bone marrow transplantation, mice were injected with NTS (150 μl per 20 g body wt) and analyzed on day 10 after disease induction. One day prior to NTS injection and one day prior to euthanizing, the mice were placed in metabolic cages for 24 hours for stoolfree urine collection for biochemical analyses. Standard blood and urine parameters were measured using an autoanalyzer. Healthy male Cd74−/− (n=5) and C57Bl/6N (n=5) WT littermates were analyzed at the age of 20 weeks.46 NTN was induced in 10-week-old male Cd74−/− (n=4) and C57Bl/6N (n=5) WT littermates by intraperitoneal injection of 150 μl NTS. Kidneys and renal function were analyzed 10 days after NTS injection as in the other experiments. For isolation of glomeruli from ADR-treated animals, C57Bl/6N mice (n=3) were injected intravenously with ADR (25 mg/kg body wt) and euthanized after 24 hours. Mice were euthanized by exsanguination via abdominal aorta in ketamine (100 mg/kg body wt) and xylazine (10 mg/kg body wt) intraperitoneal anesthesia. The kidneys were taken and immediately processed for further analyses. All samples, if not analyzed immediately, were stored at –80°C. Mice were anesthetized using ketamine/xylazine, euthanized by exsanguination via the abdominal aorta, and directly perfused via the left ventricle with Fe3O4 (Sigma-Aldrich) diluted in 20 ml 0.9% NaCl. The kidneys were then transferred into RPMI 1640 medium (Life Technologies) containing 1% penicillin/streptomycin and cut into small fragments. Afterward, fragments were treated for 30 minutes at 37°C with 1 mg/ml collagenase type IV (Worthington Biochemical Corporation). The small kidney fragments were gently sieved through a 100-μm strainer, centrifuged and resuspended in PBS. Glomeruli containing Fe3O4 were separated using a magnetic particle concentrator (DynaMag TM-2, Life Technologies). Tissue for light microscopy and immunohistochemistry was fixed in methyl Carnoy’s solution or formalin and embedded in paraffin. The sections (1-μm thickness) were stained with periodic acid–Schiff’s reagent (PAS) and counterstained with hematoxylin. All stainings except for MIF were done in methyl Carnoy’s fixed renal tissues. The sections (1-μm thickness) were processed as described previously.66,67 Primary antibodies included a murine mAb (clone 1A4) to α-SMA conjugated with alkaline phosphatase (Sigma-Aldrich), rabbit anti-human fibrinogen polyclonal Ab (Dako), rat anti-mouse F4/80 (Serotec AbD), rat anti-mouse ErHr3 (BMA Biomedicals), rat anti-human CD3 (Serotec AbD), rat anti-human Ly6G (BD Pharmingen), rabbit anti-human CD44 (BD Pharmingen), and rat anti-mouse CD74 (BD Pharmingen) plus appropriate negative controls as described previously.68 The evaluation of immunohistochemistry was performed using the ImageJ v1.48 software (http://imagej.nih.gov/ij/). Glomerular necrosis score was calculated in 50 consecutive glomeruli exhibiting fibrinogen-positive area (score 0=0%–5%; 1=5%–25%; 2=25%–50%; 3=50%–75%; 4=75%–100%). Glomerular injury score was calculated in 50 consecutive glomeruli in PAS staining by rating glomerular sclerosis, mesangial expansion, or increased cell number (score 0=no jury; 1=1%–25%; 2=25%–50%; 3=50%–75%; 4=75%–100%). The percentage of positively stained area (F4/80 and α-SMA) in each tissue was calculated separately for 50 glomeruli and in 20 interstitial fields representing almost the whole cortical area. To assess the number of infiltrating immune cells, CD3-, ErHr3-, and Ly6G-positive cells (for glomeruli: in 100 consecutive glomeruli; for interstitium: in 20 interstitial fields) were counted. PCNA-positive cells were counted separately within the glomerular tuft or on the Bowman’s capsule but excluding the crescents in 100 glomeruli per animal. For analysis of CD44- and CD74-positive PECs, 50 consecutive glomeruli were scored (score 0=0%–5%; 1=5%–25%; 2=25%–50%; 3=>50%) All histomorphologic analyses were done in a blinded manner. MIF staining was done on formalin-fixed tissue with heat-induced antigen retrieval in citrate buffer (pH 6.0); all other stainings were performed on methyl Carnoy’s fixed renal tissues. Primary antibodies included a rabbit anti-rat MIF (Life Technologies, Darmstadt, Germany), rat anti-mouse CD44 (BD Pharmingen), rabbit anti-human CD74 (Sigma-Aldrich), rat anti-mouse CD74 (BD Pharmingen), rabbit anti-human Ki67 (Abcam, Inc.), mouse anti-human CD31 (Dako), and rat anti-mouse F4/80 (Serotec AbD). Alexa647-coupled donkey anti-rabbit, Alexa555-coupled goat anti-rat, and Alexa488-coupled goat anti-rat were used as secondary antibodies. Total RNA was collected from renal cortex using the RNAeasy Mini Kit (Qiagen, Hilden, Germany). RNA purity determination and cDNA synthesis were performed as described previously.69 For the normalization of the data, the standard ΔCT method was used with GAPDH as the housekeeping gene. The expression of genes of interest was calculated as relative expression units in comparison to WT or control group (arbitrarily set as 1). The sequences of primers used for real-time qRT-PCR are shown in Table 2. Primary podocytes and PECs were isolated and cultured as described previously.31 For stimulation, mesangial cells, PECs and podocytes were seeded into six-well plates and incubated with 5 ng/ml recombinant human TGFβ1 (R&D Systems), 25 ng/ml ADR, 100 ng/ml rmMIF, and 0.1% NTS, or vehicle for the indicated time periods. Afterward, supernatants were taken for TCA precipitation and cells harvested for protein lysates. For the analysis of cell proliferation, mesangial cells, PECs, and podocytes were seeded into 24-well plates and growth-synchronized by serum deprivation for 24 hours before stimulation with 100 ng/ml rmMIF or vehicle. Manual cell counting in Neubauer chambers was performed at daily intervals following stimulation. To quantitatively analyze cell proliferation, 5-bromo-2-deoxyuridine assay was performed according to the manufacturer’s protocol (Roche Diagnostics). Briefly, cells were seeded into 96-well plates and growth-synchronized by serum deprivation for 24 hours. One hour prior to stimulation with 100 ng/ml rmMIF or vehicle, cells were incubated with neutralizing CD74 antibody (BD Pharmingen). Cells were lysed in RIPA buffer (50 mM Tris-HCl, 150 mM Nonidet P-40, 1 mM sodium deoxycholate, 1 mM EDTA, and 1 mM sodium orthovanadate) containing complete protease inhibitor cocktail (Roche Diagnostics) at 4°C for 15 minutes, sonicated three times for 10 seconds, and centrifuged at 10,000g for 15 minutes at 4°C. Supernatants containing cellular proteins were collected and protein concentrations determined by bicinchonic acid protein assay with BSA standard (Interchim). Secreted proteins were precipitated using TCA and subsequently analyzed by immunoblotting. Confirmation of active secretion without cell death was proven by negative detection of GAPDH (data not shown). Denatured protein samples were separated by electrophoresis in 10% SDS-polyacrylamide gel, transferred to nitrocellulose membranes, blocked with 2% (w/v) BSA in PBS, washed with tris-buffered saline with tween, and incubated with primary antibodies diluted in tris-buffered saline with tween overnight at 4°C. The following antibodies were applied: mouse anti-human GAPDH (Novus Biologicals), rabbit anti-rat MIF (Sigma-Aldrich), and rat anti-mouse CD44 (BD Pharmingen). Primary antibodies were detected using horse radish peroxidase-conjugated antibodies and visualized by enhanced chemiluminescence (Roche Diagnostics). GAPDH quantification was performed on the same nitrocellulose blots to normalize for loading incongruities. Band intensities were quantified by Scion Image software. Cells were treated with fluorochrome-conjugated antibodies against CXCR2, CXCR4, and CD74 for 30 minutes at room temperature along with the respective isotype controls, and analyzed by flow cytometry as described previously.34 For CD44, a rat anti-mouse antibody and a fluorochrome conjugate secondary antibody was used. All values are expressed as means±SD. Comparison of groups was performed using the Mann–Whitney U test. Statistical significance was defined as P<0.05. J.B. and R.B. are coinventors on patents describing anti-MIF–based therapeutic strategies. All other authors declare no competing interests. This work was supported by financial research grants of the Else-Kröner Fresenius Foundation (EKFS 2012_A216) to P.B. and J.B., by grants of the German Research Foundation (Deutsche Forschungsgemeinschaft) to P.B. (BO 3755/1-1 and B.O. 3755/2-1), to J.F. and T.O. (FL 178/4-1) and within the SFB/Transregio 57 “Mechanisms of organ fibrosis” to P.B., J.F., M.J.M., T.O., and J.B. Further support came from the Interdisciplinary Centre for Clinical Research within the Faculty of Medicine at the RWTH Aachen University to T.O. and J.F. (E7-2) and to P.B. (K7-3). C.D.C. and M.T.L. are supported by the Else-Kröner Fresenius Foundation. R.B. is supported by the US National Institutes of Health. The technical assistance of Cherelle Timm, Claudia Gavranic, and Simon Otten is gratefully acknowledged. We thank all participating centers of the European Renal cDNA Bank–Kroener–Fresenius Biopsy Bank and their patients for their cooperation. Active members at the time of the study are listed in Martini et al., J Am Soc Nephrol 25: 2559–2572, 2014. J.B. and P.B. are both senior authors. This article contains supplemental material online at http://jasn.asnjournals.org/lookup/suppl/doi:10.1681/ASN.2015020149/-/DCSupplemental.